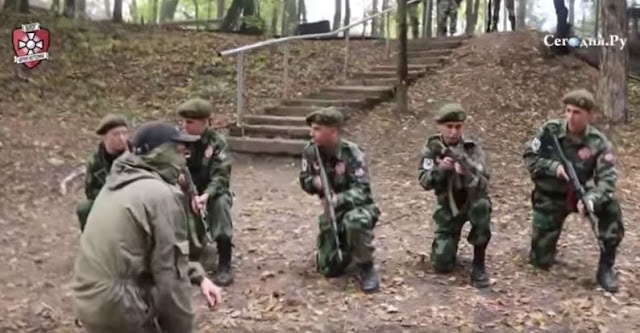 Serbian children in military training in Russia? A video is casted on the Internet which shows children believed to be from Serbia, going through intensive training, learning to fight with weapons, climb, fight with hands, and more. Is unknown whether the shooting was made in Serbia, Russia or Ukraine, but the coaches speak Russian and a person translates them into Serbian. It is shocking to see the "students" trained in in this way. The question is whether this military camp for 'youth' has to do with Serbia's honor, a unit of organized fighters. In addition to guarding Arkan's widow, Ceca Razhnatovic, they often visit Moscow and their leaders are known in the crime scene. Igor Bilbia from Prijedor is arrested for prostitution, fraud and organized crime, and Bojan Stojkovic from Niš is known as "the most powerful Serb," Croatian media writes.